"I didn't want to join a Yahoo group, but my professor said I had to for 10% of my mark in this subject." "If you don’t wish ‘live’ tweeting during your presentation please advise your chairperson prior to your session." "I was more or less coerced into joining Facebook because a SIG I support could not find a moderator for its FB Group. Hey ho!" "I lurked on the Twitter Chat because I hate that sort of thing. They spent half the time introducing themselves. It was pointless." "I can't avoid being involved in some social media, and I quite like it. But Pinterest? NO WAY." "Look, if the organizers insist on allowing live tweeting of my Keynote I will simply pull out. Got it?" "I had no notion of the possibilities of social media as a professional resource. Twitter is a revelation. I'm hooked!" "Social media is called social media for a reason. It lends itself to sharing rather than horn-tooting." "In the circles I move in, a high proportion of tweets are messages pointing to a weblink, which may be a newspaper or journal article or a blog. This is where Twitter is such a useful resource for the academic: if you follow those who share your academic interests, they will point you to interesting stuff." More than ever before, Speech-Language Pathologists are pushed to engage professionally via social media, whether they want to or not. Disinclined senior and not-so-senior members of the profession report feeling they have been dragooned and thrust into online interaction with fanatics, hell bent on creating, sharing, and exchanging information and ideas in virtual communities and networks; and they resent the time it occupies. Newly appointed chairs, presidents, CEOs, councillors and committee members reluctantly sign on to Twitter and Facebook because it has come to be expected of them, and many of them partake minimally if at all. By contrast, enthusiastic converts 'get' its purpose and utility, integrating near-daily social media involvement into already busy schedules. Speechwoman (@speechwoman) is somewhere in the middle, fascinated by the relentless growth of the current social media platforms, conscious that more is to come, and participating actively but selectively. 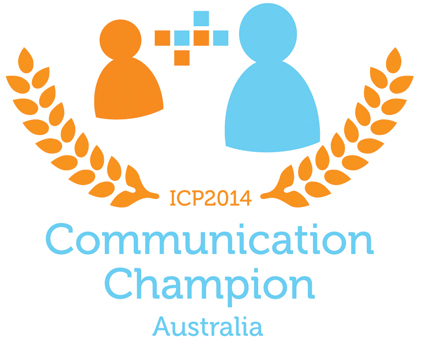 Nowhere is the push to participate more apparent than in the International Communication Project 2014 (#ICP2014). In 2014, professional associations, Speech-Language Pathologists, and students of communication sciences and disorders unite to increase world awareness of who we are and what we do. The purpose of this extraordinary yearlong international campaign is to publicise the fundamental importance of communication and the crucial difference communication professionals can make – particularly when they are involved early. Australian Nation for Communication champions support this global effort in large and small ways that could snowball to change many people's lives for the better. The champions' message is simple: communication is a human right, since people must be able to communicate to fulfil their social, educational, emotional and vocational potential. As #ICP2014 participants, SLPs have learned a lot about under-served communities at home and further afield. They have also become more aware of the ever-increasing workload shouldered by the Mutual Recognition Agreement associations: ASHA, IASLT, NZSTA, RCSLT, SAC, and Speech Pathology Australia (Bowen, 2012), the benefits they offer, and their policies. A policy is a course or principle of action adopted or proposed by an organisation or individual. The application of a policy, as opposed to facts, opinions, discussion, theories and research relating to it, can be summed up in one word: practice - the customary way of doing something. Professional practice involves the display of competence and specialist expertise anticipated in a professional, or professionalism. Professionalism in any paid occupation that requires prolonged training and a formal qualification is always bound up with other attributes: accountability, clear communication, quality assurance, steady reasoning and decision-making, effective leadership, lifelong learning, respectful workplace etiquette, and appropriate comportment. On top of this, a clinical profession, like speech-language pathology, has its unique occupational standards of practice, ethics, and agreed procedures including professional self regulation. They all reside in the context of the profession's unfolding history and development of expectations for state-of-the-art clinical competence. Competence is the cornerstone of clinical preparation, and its pursuit is exemplified in COMPASS®. Supremely practical, COMPASS is a tool designed to validly assess the performance of Australian speech pathology students in their placements. It has four Professional Competency Units: Reasoning, Communication, Lifelong Learning, and Professionalism. For individual SLPs and students, one aspect of professionalism is deciding whether to join, support and represent; and be admitted to, supported and represented by, a relevant professional association. In deciding, most will consider the cost benefits and tangible advantages of membership, and what membership says about them. The Journal of Clinical Practice in Speech-Language Pathology (JCPSLP) Webwords column is accessed online by at least 1.5 million readers per month worldwide, while most JCPSLP readers are Speech Pathology Australia members who receive it in print as a magazine, and who can also retrieve it electronically. These are two of many member benefits SPA delivers in its key role as a beneficial resource for its members. It also provides: representation to external bodies and the general community, public relations, several publications in addition to JCPSLP, continuing professional development, member services, and the coordination and drafting of submissions to funding bodies, government departments and research authorities. Kelly Cherwin, Communications Editor of HigherEd Jobs reflects on the potential for association membership to enable a professional to further important career goals. She addresses her topic in terms of building a professional network, utilising career-related resources, and developing discipline-specific knowledge. Cherwin's target readership is higher education professionals seeking academic appointments. But if she moseyed on over to the Speech Pathology Australia website, or attended an Association event or online forum in order to gather illustrative examples of what she means, she and her readers would not be disappointed. SPA membership offers many satisfying opportunities to give and receive help and support in reaching professional goals within secure, trustful relationships. What does association membership say about me? From a cynical onlooker's perspective, association membership may just say that the member is a conformist or even a pragmatist who knows which side his (3% of SLPs in Australia) or her (97%) bread is buttered. But for most observers it probably sends a message to colleagues and to the public that you care about your profession, value continuing professional education, are in touch with key issues and developments in your discipline. It tells them that you and your profession count for something, that you are active in the field, and in it for the long haul. Our professionalism is on display virtually all the time in the real world, and all the time in the virtual world. It is represented in everything we post or broadcast in Blogs and Blog comments, Facebook, Google Hangout, Instagram, LinkedIn, Listservs®, ORCID, Podcasts, Pinterest, ResearchGate, Twitter, Yahoo! Groups, YouTube (and whatever comes next in any and all media of expression now known or later developed and in all languages!) (Hemsley, Bowen, & McCabe, 2013). So we have to be mindful of online comportment, whether we are in a gated 'professional' network such as SPA's Member Communities, a 'mixed' network like Speech and Language Therapy where professionals and the general public interact, or Twitter where everyone can see everything, unless you lock your account. The perceived lack of regulation and well thought out policies governing its professional use may partly explain the reluctance of many leaders, bright, thinking newcomers, and experienced clinicians in our field to embrace social media as a regular practice. The future of social media as a powerful vehicle for knowledge dissemination and positive change is in our hands. We need to talk about it, and we need to talk about it soon. Bowen, C. (2012). Webwords 42: Professional issues. Journal of Clinical Practice in Speech-Language Pathology, 14(1),42-43. Hemsley, B., Bowen, C. & McCabe, P. (2013, November). Speech Language Pathologists navigating Twitter: Everyday ethical decisions in publishing, exchanging information, and engaging across multiple blurred boundaries. Paper (30 minute oral presentation) presented at American Speech-Language-Hearing Association Convention, Chicago, IL, USA.